Since they're made by hand, each has its own look, name, and lovable personality. 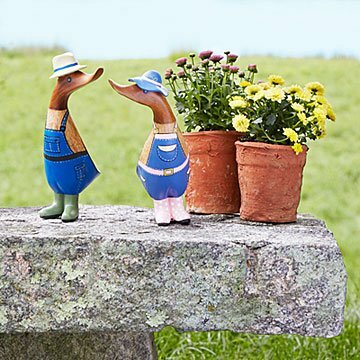 Ducks may be associated with air or water, but this pair of darling duckies really digs gardening. Each one is hand-carved from sustainable bamboo and reclaimed teak by artisans in Indonesia, and finished with hand-painted sun hats, overalls, and wellies. Since they're made by hand, they all have their own look, name, and lovable personality. Individually or as a pair, these feathered friends will brighten the home of any avid gardener, or you can give them a coat of varnish and let them enjoy the fresh air puttering around your garden or patio. Handmade in Indonesia. Due to the handmade nature of the item, each duck is unique and may vary from one to the other. these ducks were super cute, I just must not have read the description as carefully as I should have, & they were much smaller than I anticipated. I'm only giving this review so others can be sure to Read (as I didn't, oops!) the dimensions to make sure it'll serve the purpose you're hoping for. I was hoping these would go well in my mother-in-law's garden, but they're too small for the space so we need to find another cute spot for them. they were well made & very darling, though! I have bought items from Uncommongoods before and will continue to do so. I always find cute and useful things for friends, family, and myself. Adiraboe,bought the pair as a gift. Will buy them 4 myself! Love these ducks. adorable personalities! So cute! Details are spot on! I would definitely by again! My sister has a garden and lives in Eugene.